Starting today we will be posting these podcasts of individual chapters of “Three Up On Seventeen”, the book written by my Dad last year. It’s an informative and humorous look “inside the ropes” of the great game of golf and the characters and life lessons associated with it. 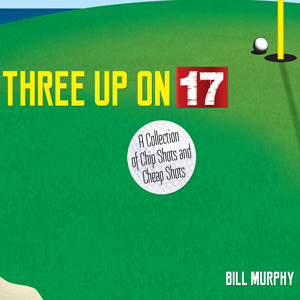 “Three Up On Seventeen is perfect gift for Fathers Day! Available now at a substantial savings (84%!!) right now at Amazon! PURCHASE NOW FOR FATHERS DAY! This entry was posted in Sports and tagged audiobook, bill, book, funny, golf, humor, murphy, seventeen, sports. Bookmark the permalink.